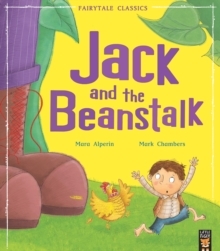 When Jack climbs up an enormous beanstalk, he discovers a giant's castle high up in the clouds. But the giant likes to eat little boys... How ever will Jack escape?My First Fairytales are a magical introduction to the well-loved stories that are a key part of every childhood. With fresh and fun illustrations, these simple re-tellings of classic fairy tales make a perfect bedtime read for three to six year olds. Make sure you collect Goldilocks and the Three Bears and Little Red Riding Hood, too!